What is senders list in Auto Mail Sender™ Standard Edition (AMSSE)? In AMSSE, “Senders List” means that you can create more than one sender accounts (our delayed email sending software uses SMTP protocol to send emails, so, on the interface, you will see “SMTP accounts”). P.S. SMTP = Simple Mail Transfer Protocol, and it’s supported my most email servers/providers, but the normal users may not understand SMTP, so we simply call “SMTP accounts” as “email senders” here. Why need the senders list in our delayed email sending application? Since our sending delayed email program is designed to send email automatically, and you cannot interfere with its automatic work. Consider this: when a scheduled email cannot be sent out due to the email sender is unavailable, how to let it work automatically? So, we designed the senders list function in our sending delayed email software - when the specified or default one is not working, our timed email sender will pick the available one to send the scheduled email. And today, there are many free email providers, such as Gmail, mail.ru, outlook.com, hotmail.com, etc. So, it’s not a problem to create a senders list for use. How to use senders list feature in our delayed email sending program? 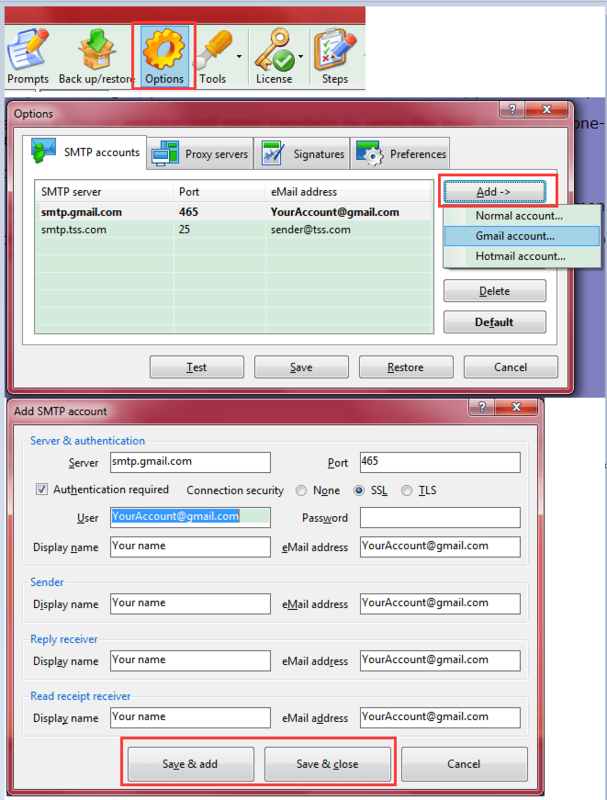 Screenshot: how to create SMTP account in our timed email sender. Note: click here to know more details about how to create sender/SMTP account. Once the sender list is created, AMSSE will be able to select the available one for use when the specified one of the template or the default sender account is unavailable. Download AMSSE to Send Delayed eMail for Windows® Now!